Whether you’re a plastic lover or hater it’s always a good idea to have some glass containers as part of your meal prep system. They don’t stain or hold onto strong smells like plastic containers do so they’re good for storing foods in the fridge or freezer during the week. They’re also oven safe (where plastic containers are not) so there’s less washing up when you’re reheating dinner since you don’t need to transfer meals from plastic container to a baking dish to reheat. 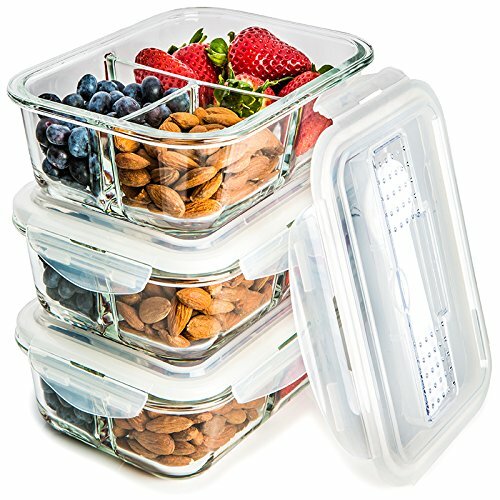 Here’s our pick of the best glass meal prep containers to get you started. Mason jar containers are great for meal prep lunches because you can fill them with salads or even turn them into Buddha jars. You can also use them at breakfast time for making overnight oats or freeze-ahead smoothies. And they’re perfect for freezing soups, keeping fruits and veggies fresh and filling with healthy desserts. 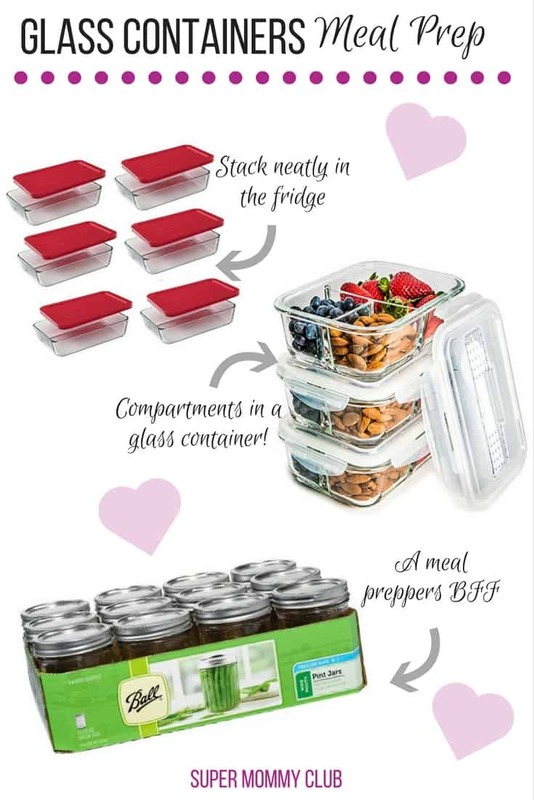 Seriously if you only want one type of glass meal prep containers then get mason jars because they’re great for portion control and are about as versatile as you can get! A 16oz jar (pint) is a great portion size unless you are using them for salads and you LOVE lettuce in which case go for the 32oz size (quart) to leave plenty of room for those leafy greens! Make sure you choose the wide mouth version because it makes it easier to eat directly from the jar with a spoon. Oh and here’s a tip if you want to use your Mason jars for freezing, if you look closely there is actually a line near the top of the jar marked “For Freezing” which leaves enough room in the jar for the food to expand as it freezes. Clever right? 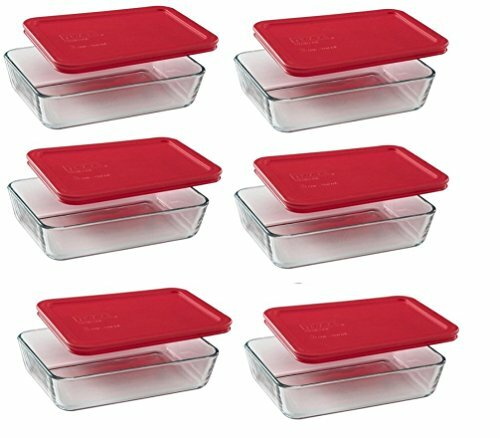 When you think glass storage containers you probably think Pyrex and this set of rectangular containers with lids is a great way to keep food fresh in the fridge all week. If you are starting from scratch with your glass container collection then make sure you buy multiple containers that are the same shape and size so that they stack neatly in the fridge. The neater things stack the better use you will make of the space. 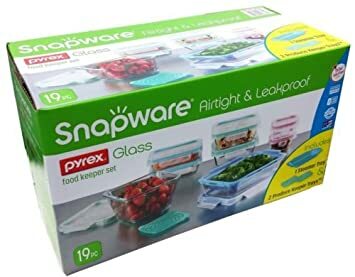 This set stacks really nicely and of course being made of glass they can safely be used in the fridge, freezer, dishwasher, oven and microwave (just remove the lid first as that is plastic). Unlike the previous set these Pyrex containers have lids that fasten with a clip and they are advertised as being 100% airtight and leakproof making them suitable for use on the go. 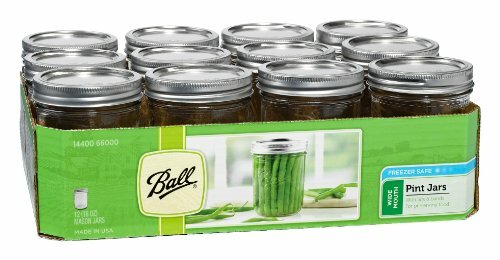 This popular set includes eight containers with lids, one steamer tray and two produce keeper trays. Storing your fruits and veggies in the produce trays should help them last longer and the steamer tray is useful for separating items in the containers. It’s so important to label your containers when you’re food prepping, especially if you’re filling your freezer, and these lids are specifically designed with an are that can be written on with a wet erase marker. If you really hate the thought of plastic containers for lunches on the go but you really still want your three compartment Bento style lunch box these are the lunch boxes for you. They’re made from glass, and have two fixed dividers inside, making up the three compartments. There’s even a clever storage area in the lid for your knife and fork! Each container holds 32oz so they’re great for portion control. They’re safe for use in the fridge, freezer, microwave (without the lid) dishwasher and oven. Previous PostPrevious Mother’s Day Gift Guide to Show Mom How Much You Love Her!